Begin by going to MyAccount.Google.com. so you can switch with these instructions). 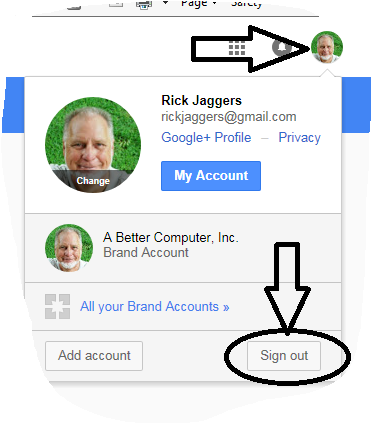 If you are signed in with another account, then sign out. How can you tell? Look in the upper right corner. If there is an image or a letter of some sort, then you are logged in under that account. Click on the image, and a pull-down menu will appear. Next, in the same upper right corner, click on the "Sign in" button and proceed with the username and password provided. The username will be a gmail.com email address. (You may have to add the username as a new account....) You will also need your Google/GMail password. In the upper right corner of the screen is a 3x3 square of blocks. This actually represents a pull-down menu with all the Google Goodies! Calendar ~ Did you know that you can share this calendar with the public, and they can simply add it to their own Google calendar so that your events automatically show up? Blogger.com ~ At the very least we'll set up a private blog for our own use. More on that, later. My Business ~ This is a really important link if your company has a real place-of-business with a street address and hours of operation. This is used by Google for SEO!! I use Google Hangouts for video conferencing. But wait, there's more! But I'm not going to go into them here. The final link, "Even more from Google" goes to a full page of all Google resources, with links and descriptions of each one. When you have time, and you're curious, go exploring!